I had never used the switch since we park next to the house with electrical hookup but when checking the batteries I thought I would see if it worked. The red light is on and the battery switch is on "on". I tried to turn it to "store" and I could hear a solenoid sound like it was trying to turn it off but the switch will not stay down. Is there something simple that I am not doing or perhaps something came loose. Since I am a little "electrically challenged" I don't want to take out the screws to see if something is loose. Do I just need a new switch? Figured I should get it fixed before the next trip. Switch will not stay down to the store position. If I hold it down I can hear a clicking noise but if I let got of the switch I get the same clicking noise and the red light is back on meaning it is in its regular mode. At least it is stuck in the run mode and not in the store mode. Any input? This is for my 2010 2551, the relay and converter are located differently in some other models, but the schematic is probably the same. The battery disconnect relay is located under the passenger side bed next to the converter/charger, the disconnect switch and light are located next to the entry door. The disconnect relay is a latching relay that mechanically latches in the closed or open position after receiving the corresponding 12V signal from the battery disconnect switch. The disconnect switch is a two way momentary contact switch that momentarily sends the signal to the relay for both the "USE" and "STORE" positions. Being momentary means that the switch does not stay in either position, just returns to center when released. The "STORE" position is the disconnected or open position for the relay. 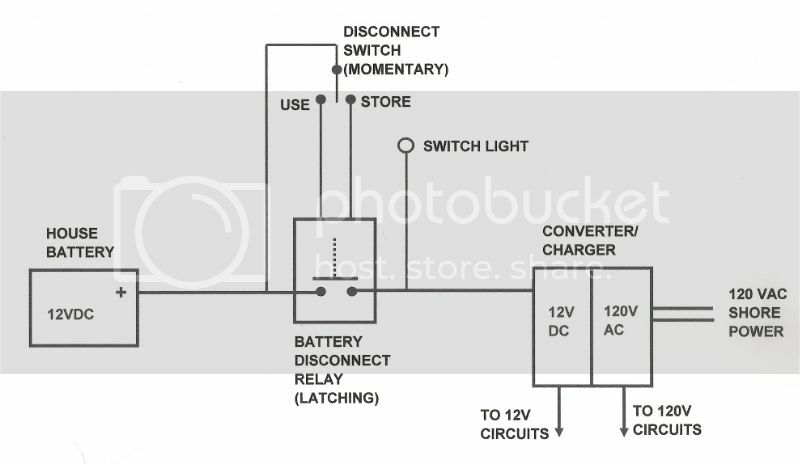 You can see in the schematic that even with the relay in the disconnected open position that the light at the doorway switch will be powered and stay on if the converter is plugged into shore power and thereby providing power to the 12V circuits. When not plugged into shore power the switch light will go off in the store position. yep, if you are plugged in, it is always on. The switch only works for long term storage when not plugged in. It only helps if you forget to turn off something. If you don't, don't worry about the switch. Actually, the switch and relay both work when plugged into shore power, just the light doesn't go out when the relay is open (store). I have verified this by checking voltage on both sides of the relay in various configurations. When I am plugged in for an extended period, I sometimes open (store) the relay so that the batteries are not being charged uneccesarily. This can be verified by watching the battery voltage on the inverter panel, it will go down to a resting voltage with the relay in the open (store) position, and then go up to a charging voltage in the closed (use) position. The amount of charging voltage depends on the state of the batteries. Well, I unplugged the electrical cord and tried the battery cut-off switch and I works. The light went out and when I tried the interior lights they did not work. I had tried it with the electric connected and as soon as you took your finger off the switch it clicked again and when I tried the interior lights they always worked. I looked everywhere and found no place where it tells me that the switch only works when you are NOT connected to ac electric. I will not worry about it anymore because I now know it works. Thanks for the information and schematic. I found the service manual for ours on line and printed it out to go with all my other PC information. They don't mention it not working unless you unplugged either. If I still had blond hair I could use that as an excuse but am feeling kinda dumb today. That's the way mine works also. Some maybe different. I had an Intellitec solenoid fail on a 2005 Rexhall and was a "walk home" but that isolated the starting battery. I prefer a mechanical switch. Earl quoted $100 to substitute inlieu of the solenoid.